Information about noise due to demolition work of near building. We inform you that the adjacent building will be undergoing construction work. The construction will make noise during the time below. We sincerely apologize in advance for any inconveniences and we thank you for your understanding and cooperation. Scheduled for 2 months from March 11, 2019. Time 9AM ~ 6PM every day. Discover the new Hotel Gracery Kyoto Sanjo! Hotel Gracery Kyoto Sanjo is located in the Teramachi Shopping Arcade area, one of Kyoto’s shopping districts. The historic street is lined by numerous long-established shops that have been handed down from generation to generation. Guests can explore the tourist attractions of the area as well as enjoy shopping in the city. Moreover, access to the 15 World Heritage Sites and other tourist attractions scattered over Kyoto is very convenient from the hotel. The bathroom and washlet-equipped toilet of each room of the hotel are separated, and all rooms are fully outfitted with the latest Japanese-made “nanoe” air purifiers as well as Wi-Fi. Concierge service is available at the front desk. For breakfast, a buffet featuring an abundant variety of local ingredients can be enjoyed. 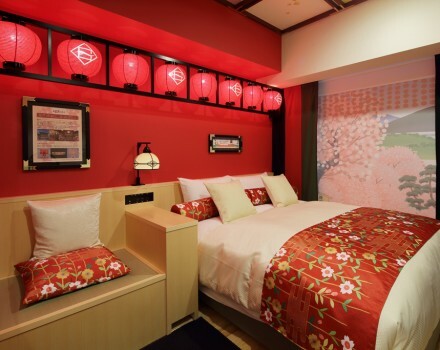 Hotel Gracery Kyoto Sanjo is an ideal base for business and leisure travelers. We are committed to providing you with a comfortable stay in Kyoto.